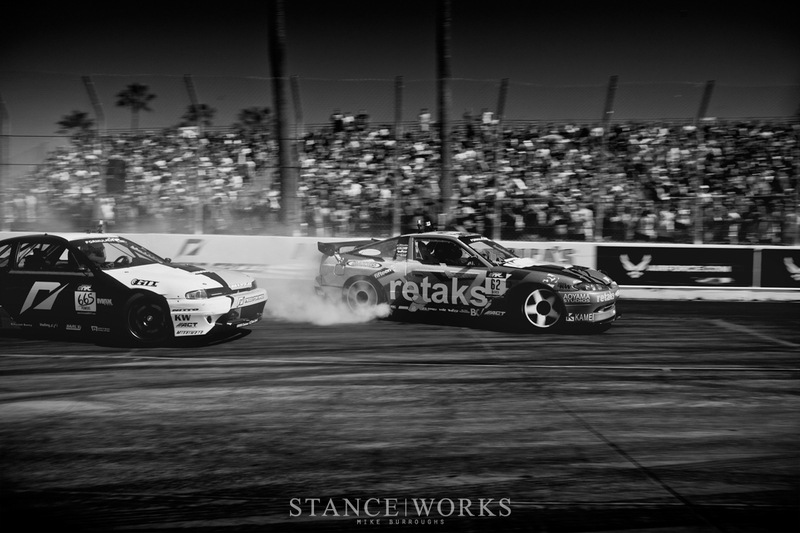 In our first step forward to tie together our own world with the world of motorsports, and to bring driver and enthusiast together, Ryan Tuerck and the Retaks S13 mark the first of our Driver Profiles. 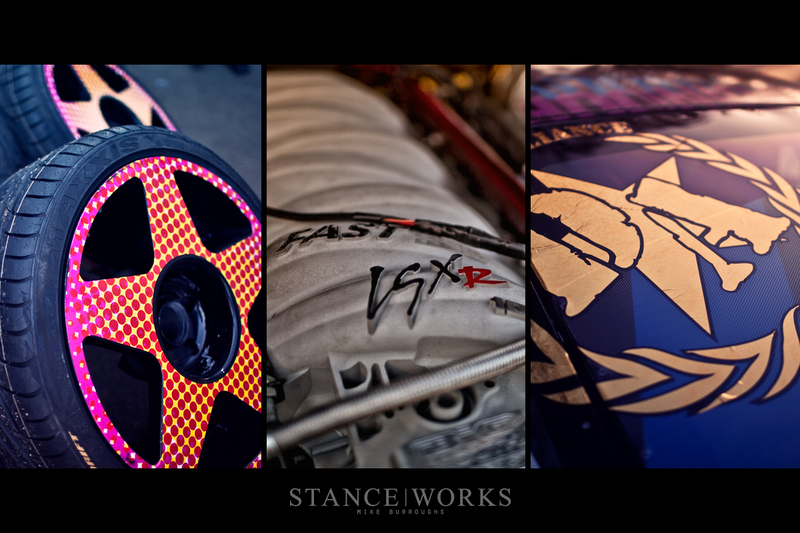 As the #1 qualifier at the first round of Formula Drift, and as many will tell you, "the one to watch out for in 2012", Ryan's story of "big guy gone small" resonates with the grassroots weekend warrior inside us all. If you follow the Formula Drift series, there's no question that Tuerck's name rings a bell. 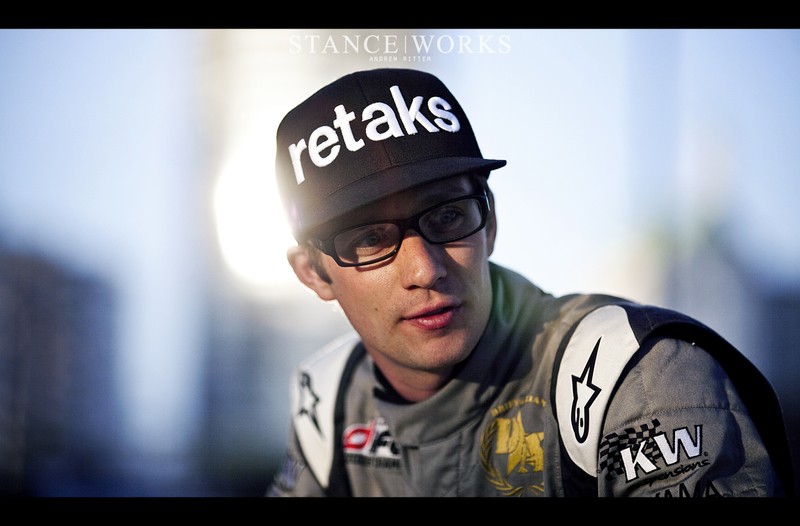 Ryan finished 2nd place in 2009 and 3rd in 2010, cementing his name as a truly competitive driver in the series. His success brought him up through the ranks, eventually landing him in the driver's seat of the Red Bull/Mobil 1 Camaro for the 2011 season. It's a position countless young drivers across America, and the world for that matter, could only dream of finding themselves in. There's a lot to be said for anyone driving for the larger teams in the series, but it unquestionably comes with its downsides. As Ryan matured through the sport, something went missing. The sense of urgency and the constant need to please everyone from managers to sponsors quickly outweighed his love for driving, thus he made the changes needed to get back in the action. It's quite apparent that Ryan is no longer driving the massive Chevrolet; instead, he's back where he began. The strong, defined lines of the wide Camaro have been replaced by the familiar sweeps of an S13 hatch, and some of the big name sponsors representing million-dollar companies have been replaced by the names of smaller brands, bringing Ryan and his team full-circle. Ryan poses more of a threat than ever this year, as his seat time in the S13 chassis doesn't end at the end of each FD event. His personal drift missile is an S13 as well, meaning every drift session is spent growing more and more familiar with the race-day chassis. Yet, that hardly scratches the surface. 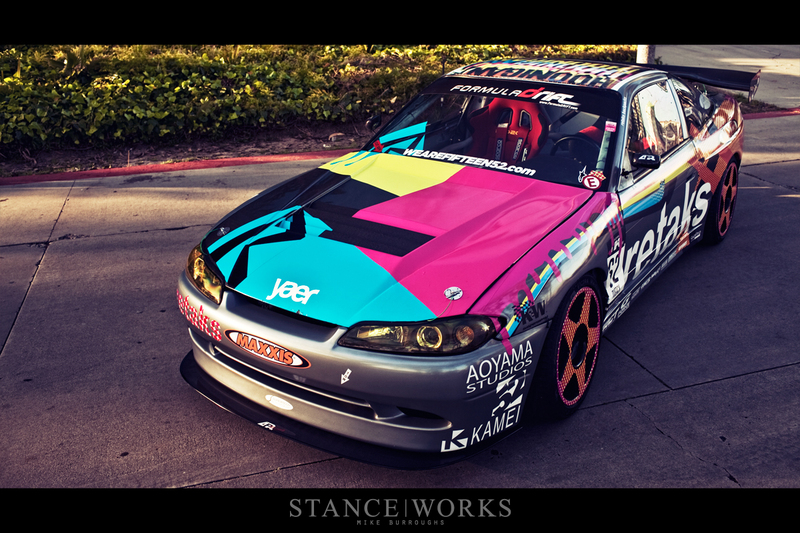 Ryan's daily driver is also an S13, meaning nearly all seat time counts for something. Rumor has it, he even sleeps in the car too. It's all part of Ryan's comeback. After a 7th place finish in the 2011 season, he knows it's as important as ever to take home a podium finish to solidify his message. In the end, Ryan's enthusiasm is no different than the parking lot sliders that gather on weekends once a month to tear up tires on their homebuilt creations. 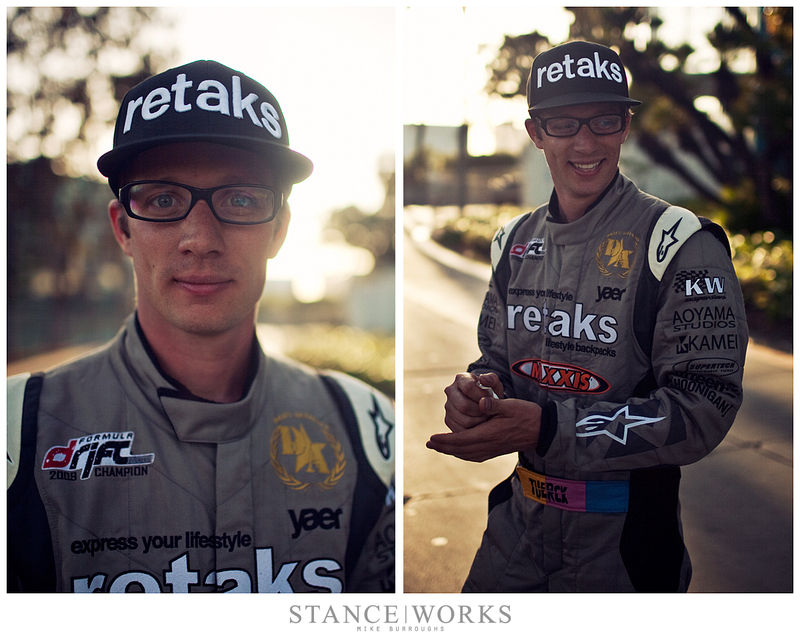 He's on a path to prove that Formula D hasn't left its roots entirely. 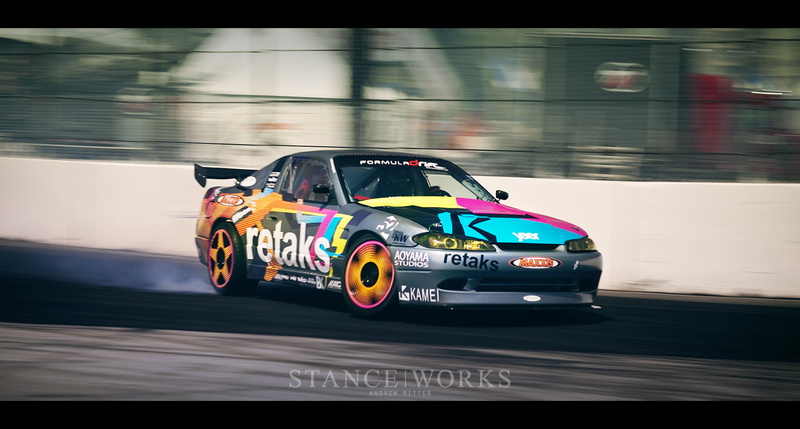 The battle-ready Retaks S13 is equipped to take on the massive teams and their $6-digit monsters. With somewhere around 600 horsepower pumping from the LS V8 heart, through Nissan veins, the Maxxis tires are reduced to a black filthy residue in an instant. 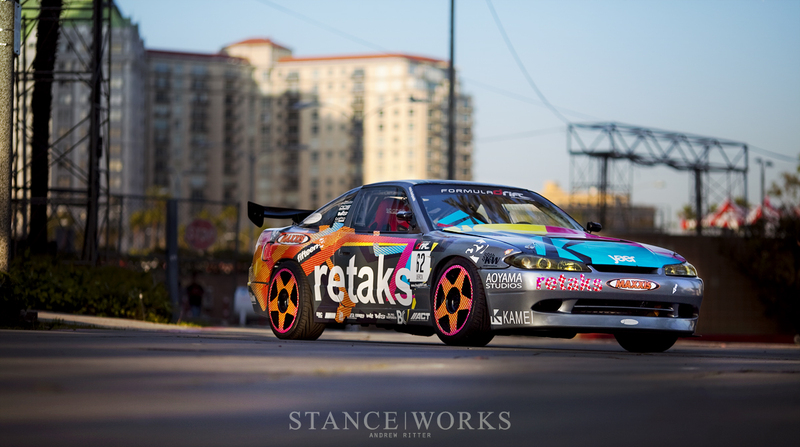 The dot-matrix Fifteen52 Tarmac wheels and the matching livery ensures the car stands out amongst the others in one of the loudest and most fun liveries on the track. The car as a whole speaks in some ways to Joshua Herron and Will Roegge's message: Keep Drifting Fun. As we sat on the curb with Ryan, learning the ins-and-outs of his career so far, one sentence spoke louder than others. "I'm finally having fun again." Ryan was given a clean slate and the ability to revisit the reasons he fell in love with the sport to begin with. The importance of the story, however, carries far more weight than a simple happy ending: it speaks to the young guys, the old guys, anyone yearning to pitch their car sideways. The "light at the end of the tunnel" isn't necessarily where you might assume. It may be far closer to home than you had thought, only Ryan had to take the long route to make that discovery. With Round 2: Road to the Championship at Road Atlanta taking place in just four days, Ryan is gearing up to put on a show for the best event of the season. His elimination from Round 1 in what many consider to be a questionable call by the FD judges has piqued his perseverance. This time, he's not taking no for an answer, so be sure to cheer when you see the Retaks S13 rip from the back straight at Road Atlanta.